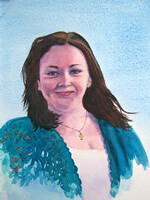 I am always struck by the almost magical way in which paint can capture the likeness and inner qualities of a person. Perhaps, as an artist, I add the further dimensions of imagination and time to the instantaneous images of the photographic age. The result is, I hope, an inspiring fruit of careful contemplation. Here you can see a few examples I have undertaken. 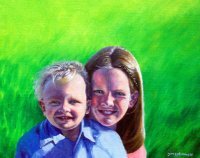 If you'd like to commission a portrait, I can work from photos if you wish. Ideally, it's a help to meet or hear something about the subject of the painting. How much it will cost depends on a number of factors e.g. 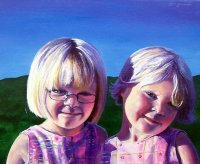 whether you prefer watercolour, pastels or oil and what size the image is to be. 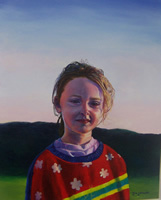 Typically, an oil portrait of 40x50cm will work out between £400 and £500 plus a delivery charge of £10. An oil painting would typically be on stretched Belgian linen and supplied without a frame. I know, it's a lot less than you'd think- so hurry before demand pushes prices up! Portraits can also be rendered in charcoal, which is proving popular, from £60.